RCF Telecom is an upstart venture that envisions a business marketplace where Small Business is no longer so small. We've studied the literature, information, and charts and come to the conclusion that one of the main things keeping small businesses from standing out is that they are simply lost in the crowd. Why you ask? Because in most cases, it is harder to find a small business than it is to just run up to the nearest big chain store and buy the name brand that they saw in a national commercial. We've figured out that the only thing keeping YOUR small business from being revered on the same level as your competitors is a mix of technology, a gifted mind for marketing, and a little dose of common sense. Once you decide to work with us, our Branding Experts put together a comprehensive Marketing Package for your business that is tailored to your particular needs. There is no one package that works for every company and we understand this, that's the backwards thinking that keeps companies small. We then present you with our package for your approval and once you're completely impressed we get to work. The driving minds behind your Marketing Packages are a core group of individuals with diverse backgrounds who come together to create a well-rounded and professional view of marketing. We take our jobs very seriously and want to create a plan that will help your business grow to its true potential. Your business is more than just a name, it is a brand and we are your Branding Experts. 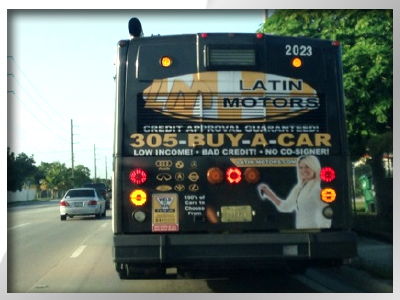 Latin Motors is a car dealership based in Miami. In their time of expansion, we helped create an ad campaign that is both bilingual and straight to the point. They have a duty to make buying a car, which can be one of the most stressful decisions in life, a lot easier and we provided them with the tools to make that dream a reality.